Super Hydorah will have a physical edition for PS4! 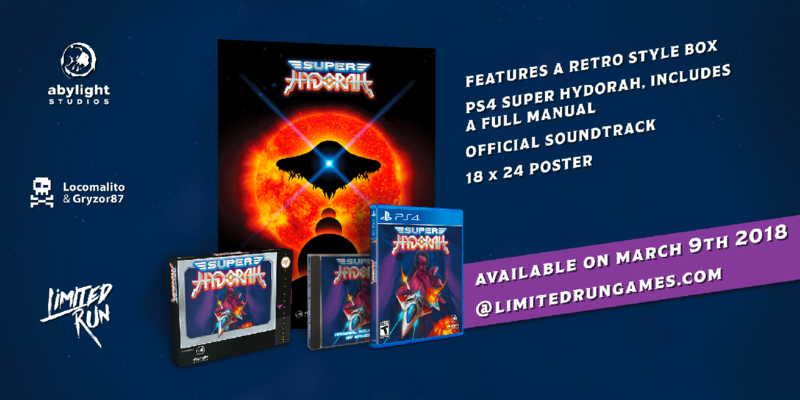 Abylight Studios and Limited Run Games have ​teamed up to ​publish a physical edition ​for PlayStation 4 of Super Hydorah, the challenging nonlinear shoot ‘em up created by Locomalito & Gryzor87! Equip your ship and prepare to take off! But be​ware pilot, this time won't be any reservations and the rules are not set by us, Limited Run will command here. However, Abylight will ​send a reminder email 30 minutes ahead of the release in each day before the sale is opened! Subscribe to our newsletter​! All the pilots willing to own their physical copy of Super Hydorah, the game that sublimates the richness and fast-paced action of traditional shmup classics, there will be 2 purchase options. The game will be available in two batches: first, 70% of the inventory at 10 AM (EST) and then the rest at 6PM (EST) on March 9th. To learn more about buying through Limited Run, you can check their buying guide. Tags: arcade, Gryzor87, limited edition, Locomalito, PS4, SHMUP, shoot'em up. Super Hydorah lands on arcade!